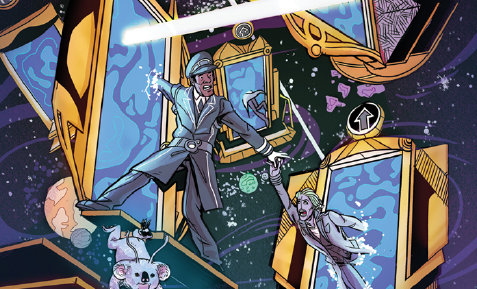 The issue starts out with a brief rundown of the history of the Doors and the Porters and also a bit of a mystery. No, I'm not talking about why anyone would prefer round ice cubes because everyone knows they are the best kind! 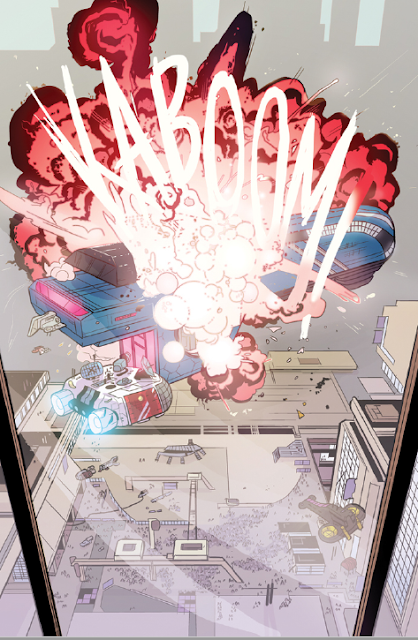 We then shift to see what the "Doorman and his Band of Miscreants" are up to and after a brief stay on the planet, Magmars, they pretty much jump out of the frying pan, into the fire and then jet pack into the center of the Sun! 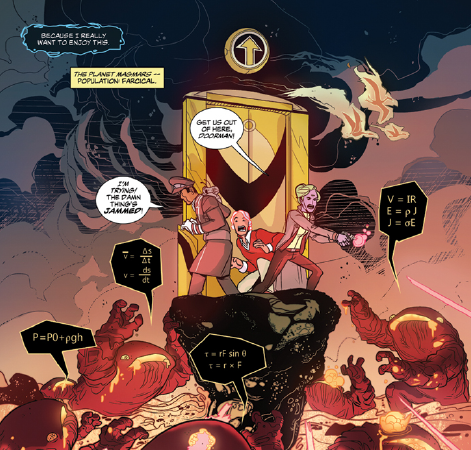 On a side note, Eliot Rahal and Daniel Kibblesmith keep showing little bits of things that I want to see much more of...like Magmars and it's "farcical" population of Math Monsters! Yes, Math Monsters!!! Back to the story, they have doored right into the clutches of Moongale and he gives them a go directly to jail card (do not pass go, do not collect $200). They immediately ask the question on my mind, why are they even alive, and we get an answer that makes total sense. Moongale wants them to see that he is right! As a guy who always wants to be right (actually, that should be "always is right), I know where old Moongale is coming from! The whole "right" thing is Moongale's Pan-Galactic Cruisers that are preparing for their maiden voyages thus putting the final nail into the Doorman way of life forever. Of course, we all know a disaster is looming, but thems the breaks! We then head off to see Moongale(s) and this is where Eliot Rahal and Daniel Kibblesmith get all psychological on us. While Moongale yells about all the money and power he is establishing in the galaxy, his clone (with a man bun to let us know the difference) gets down to the root of it all...He does what he does because he's afraid he is really a nobody. Tough stuff to hear and Moongale reacts accordingly...by knocking his clone out with a bottle! We get back to the showing everyone he's right bit, when Moongale has Henry and Flower join him for the launch of his Cruiser. We get to see the crew and the excited passengers (again, I want to see more of these zany aliens!) and I think I am not alone in thinking that if someone doesn't stop all of this, they will be no longer. Of course, Henry and Flower do try to step up, but I guess what's meant to be is always meant to be and the Cruiser blows up in a ball of fire. Oh the humanity! 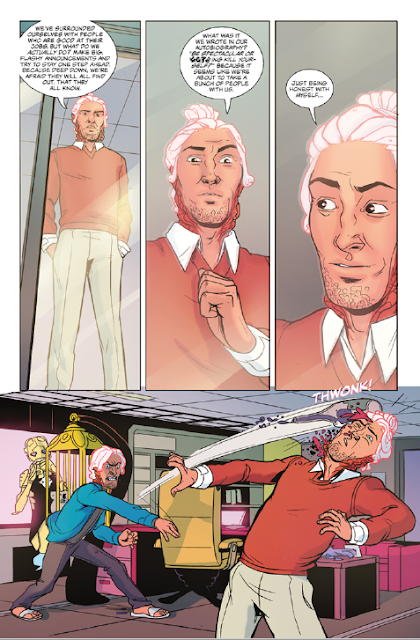 That's when clone Moongale returns in a blazing Rick Flair ball of fury and ends the insanity once and for all. Well, at least he makes it so his real self is pretty much a worthless piece of crap instead of being a powerful and wealthy piece of crap! The issue ends with a bare knuckle brawl between Moongale and Henry, Koalmanac showing up out of nowhere to save the day and one of the most gruesome pages I've ever seen in a comic book! We then get a cool extended cliffhanger with Henry and Flower working together going forward, but a ton of questions still left unanswered. I want them all answered! PLEASE!!!! I love this book. It is just pure fun and Rahal and Kibblesmith make it all work because of their brilliant character work. Even the minor characters have unique personalities that put most main characters to shame. Because of that, the reader gets fully invested in the story and actually cares what happens. Plus, the book is just downright hilarious! I really hope the fine people at Heavy Metal let the series continue because there is so much left to explore in this universe and I want to see it all. I can't say this is a good jumping on point for new readers (it is the final chapter), but I can say that reading all four issues is easily worth the time and money involved. Go read them all now! I haven't mentioned Kendall Goode yet in this review, but don't let that lead you to believe that he isn't an important part of all the fun. His art is fantastic and is just as much a part of the storytelling as the actual words on the page. His aliens are awesome, his cartoony/sci-fi architecture is awesome, hell, he is just awesome! Awesome!!! 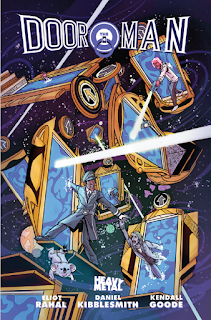 Eliot Rahal, Daniel Kibblesmith and Kendall Goode finish up this initial arc of The Doorman and if you are a fan of sci-fi, fantasy, good books, laughing...you need to pick up the whole series. I haven't made any bones about it, I love it and I want more!